Virtual Reality films change the way we see the industry as they throw us into the movie in a way that 3D animation can’t. We can turn our heads and see everything around us with this experience, it really puts the viewer in the film as it allows them to actually move with the action and the story. For the second year in a row, Tribeca Film Festival put out a collection of immersive films in their program called Virtual Arcade and Storyscapes. PSFK was able to explore both the Virtual Arcade and the Tribeca Storyscapes films, all of them could change the way we tell stories and make films. 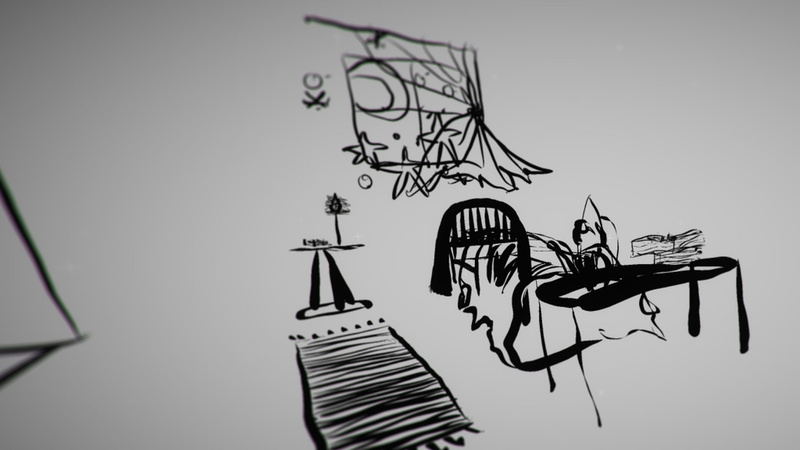 Draw Me Close, a piece that premiered at the festival takes these advancements further, providing an interactive film that truly gives its audience the full immersive experience both literally and emotionally. Playwright, Jordan Tannahill wrote and directed Draw Me Close which is a visual memoir that explores his childhood relationship with his mother when she is diagnosed with terminal cancer. In this 360 experience, you step into Jordan’s shoes as you are transported into an animated world much like the style of a child’s drawing. Jordan then begins to narrate a childhood memory while you the viewer live out this memory by interacting with Jordan’s mother played by a live actress who is in the room with you. It’s the combination of the virtual and physical environment that makes this a truly theatrical and unique experience. 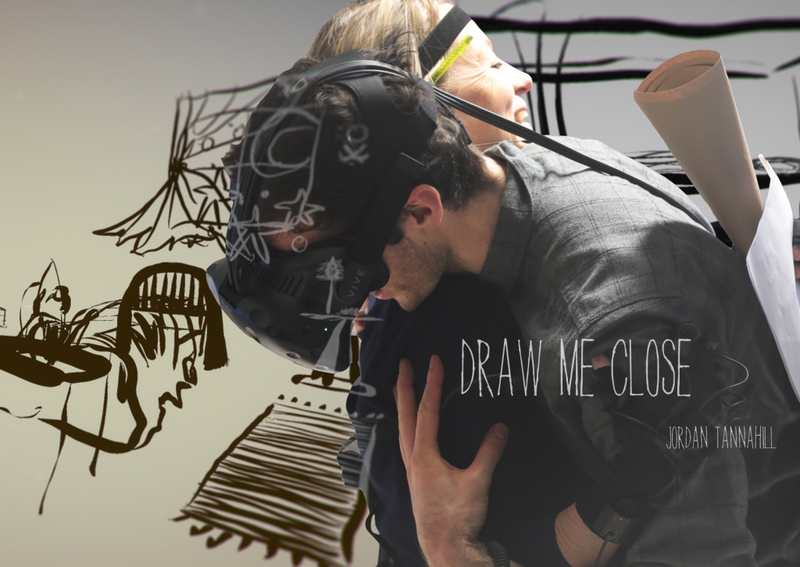 Draw Me Close combines elements of animation, theater, nonfiction, and VR to tell a very dramatic and personal story. “There’s no other story that weighs more heavily on my mind right now than my relationship with my mother”, said creator Jordan Tannahill on why it was important for him to make this film. Tannahill came up with the idea when he began interviewing his mother when she was diagnosed with cancer. He decided to bring these interviews to life and felt the only way for the audience to truly feel the connection he had with his mother was to put his audience in the story. Besides Tannahill, the other minds behind this project are the producers Toby Coffey and David Oppenheim. Coffey who is the head of digital development of National Theater in London is very proud of what they’ve achieved with Draw Me Close and is excited about the potential VR technology is giving storytellers. “I don’t think we are necessarily combining lots of types of storytelling into one, it’s more that we are bringing a number of different forms, technologies, and influences together within one storytelling experience,” said Coffey who believes we will be seeing more genre blending in the future of VR films. Audiences at the festival were only shown the first ten minutes of the film as the filmmakers are continuing to expand the piece, a feature film being one of the many possible directions for the project to go. “In two years we will have expanded the project into a number of formats with each iteration for a different and likely larger audience size,” said Coffey on what the next steps will be. Draw Me Close is a strong achievement for the future of immersive films as it shows they can go beyond stunning visuals and also pull at the viewer’s heartstrings.